This section consists of data buffers, I/O control, control and timing registers, and timing and control logic. The data buffers are 8-bit bi-directional buffers that connect the internal data bus to the external data bus. The I/O control section uses the A0, CS, RD and WR signals to control data flow to and from the various internal registers and buffers. The data flow to and from the Block Diagram of 8279 is enabled only when CS = 0; otherwise the 8279 signals are in a high impedance state. The Block Diagram of 8279 interprets the data given or desired by the CPU with the help of A0, RD and WR signals, as shown in table 14.8. When A0 is logic 0 data is transferred and when A0 is logic 1 command word or status word is transferred. RD and WR determine -the direction of data flow through the data buffers. The control and timing registers store the keyboard and display modes and other operating conditions programmed by the CPU. The modes are programmed by sending the proper command on the data lines with A0 = 1. The command is latched on the rising edge of WR. The command is then decoded and the appropriate mode/function is set. The timing control consists of the basic timing counter chain. The first counter is divided by N prescaler that can be programmed to give an internal frequency of 100 kHz. The other counters divide down the basic internal frequency, to provide the proper keyscan, row scan, keyboard matrix scan, and display scan times. 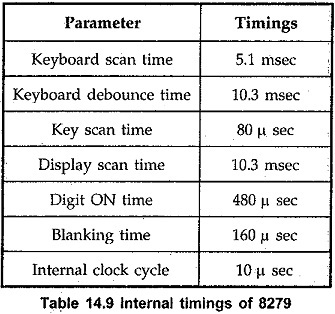 The internal frequency of 100 KHz gives the internal timings as shown in the table 14.9. The scan section has a scan counter which has two modes : Encoded mode and decoded mode. In the encoded mode, the scan counter provides a binary count from 0000 to 1111 on the four scan lines (SC3 — SC0) with active high outputs. This binary count must be externally decoded to provide 16 scan lines. Display can use all 16 scan lines to interface 16 digit 7-segment display, but keyboard can use only 8 scan lines out of 16 scan lines. In the decoded mode, the internal decoder decodes the least significant 2 bits of binary count and provides four possible combinations on the scan lines (SC3 — SC0) :1110, 1101, 1011 and 0111. Thus the output of decoded scan is active low. These four active low output lines can be used directly to interface 4 digit 7 segment display, 8 x 4 matrix keyboard, eliminating the external decoder. 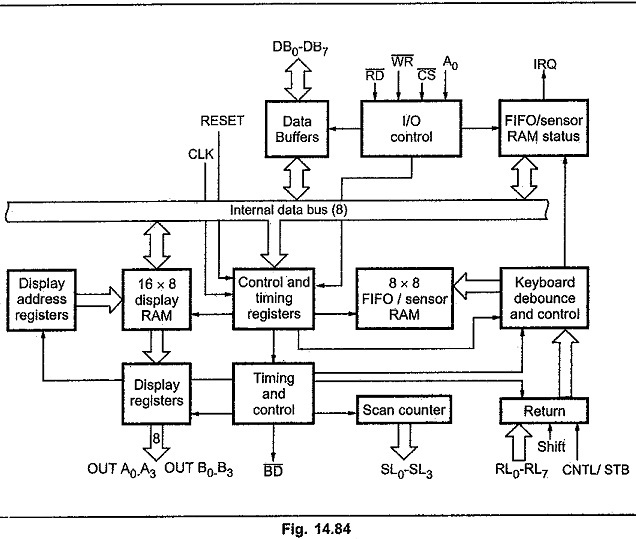 This section consists of return buffers, keyboard debounce and control, FIFO/sensor RAM and FIFO/sensor RAM status. There functions depend on selected keyboard mode out of three keyboard input modes : scanned keyboard, sensor matrix and strobed input. The 8 return lines (RL7 — RL0) are buffered and latched by the return buffers during each row scan in scanned keyboard or sensor matrix imode In strobed input mode, the contents of the return lines are transferred to the FIFO RAM on the rising edge of the CNTL/STB line pulse. Keyboard and debounce control is enabled only when scanned keyboard mode is selected. In the scanned keyboard mode, return lines are scanned, looking for key closures in that row. If the debounce circuit detects a close switch, it waits about 10 msec to check if the switch remains closed. If it does, the address of the switch in the matrix plus the status of SHIFT and CONTROL keys are transferred to the FIFO RAM. This is a dual function 8 x 8 RAM. In scanned keyboard and strobed input modes, it is a FIFO. Each new entry is written into successive RAM positions and then read in order of entry. In sensor matrix mode, the memory is referred to as sensor RAM. Each row of the sensor RAM is loaded with the status of the corresponding row of sensor in the sensor matrix. FIFO RAM status keeps track of the number of characters in the FIFO and whether it is full or empty. The status logic also makes IRQ signal high when the FIFO is not empty, which can be used to interrupt CPU telling that key press is detected and keycode is available in FIFO RAM. The display section consists of display RAM, display address registers and display registers. It is 16 x 8 RAM, which stores the display codes for 16 digits. It can be accessed directly by CPU. In decoded mode, 8279 uses only first four locations of display RAM. In encoded mode, Block Diagram of 8279 uses first eight locations for 8 digit display and all 16 lorntions for 16 digits display. The display address registers hold the address of the byte currently being written or read by the CPU and scan count value. The read/write addresses are programmed by CPU command. If set in auto increment mode, address in the address register is incremented for each read or write. Display registers are two 4-bit registers A and B. They hold the bit pattern of character to be displayed. The contents of display registers A and B can be blanked and inhibited individually.